Here are the results of what I had been working so hard last couple of month! All photos are taken by me.. 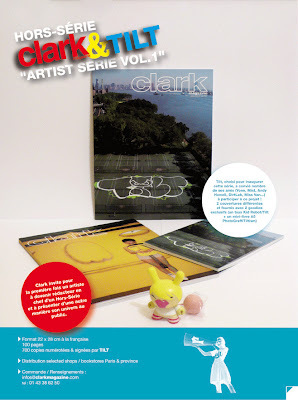 Collaboration between French artist Tilt and High-edgy steet magazine "Clark" finally came out! Tilt gathered 8 artists from all over the globe. I'm in it, as well. Other contribution artists are Os Gemeos, Andy Howell, français Mist, DirtLab, Miss Van, Yank, Tober, Der, Laguigui. In addition to regular works, I worked/ have been working on a photo book entitled "SNEAKER LOVER" and a magazine called "WARP LOVERS" that consists of only pix by me to be released towards the end of this month. Also, I'm supervising another magazine called "smart girls" and it will be released in Feb. So I'm shooting girls everyday now..
... actually, it's excuse of this delay on posting blog! From very begging of this year, i'm shooting pix like those ones attached bellow. which is so much fun.. but i'm a bit tired too! Hope you'll forgive me for the long silence from my side!